Weekend Overnight Detours for Silver Line Construction Friday, Dec. 15 at 10 p.m. - Saturday, Dec. 16 at 6 a.m. Saturday, Dec. 16 at 10 p.m. - Sunday, Dec. 17 at 6 a.m.
Friday, Dec. 15 at 10 p.m. - Saturday, Dec. 16 at 6 a.m.
Saturday, Dec. 16 at 10 p.m. - Sunday, Dec. 17 at 6 a.m.
On or about Friday, Dec. 15 at 10 p.m. through Saturday, Dec. 16 at 6 a.m., and Saturday, Dec. 16 at 10 p.m. through Sunday, Dec. 17 at 6 a.m., drivers using the westbound Dulles International Airport Access Highway (DIAAH) will experience a detour to the westbound Dulles Toll Road between Beulah Road and Route 28 while Dulles Corridor Metrorail Project crews construct the Innovation Center Metrorail Station in the median of the DIAAH. See details below and on the next page. 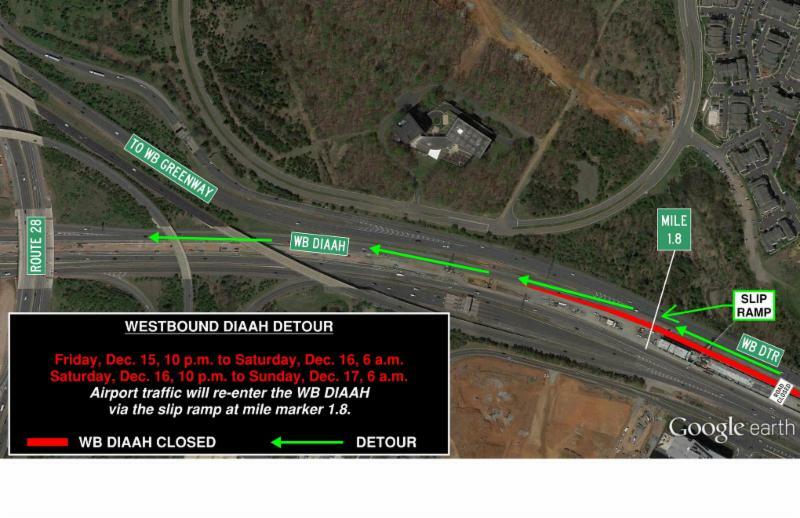 Figure 1: Traffic on the WB DIAAH will be diverted to the WB DTR near mile marker 8.3. Westbound traffic to the airport will return to the DIAAH via the slip ramp at mile marker 1.8 with no toll payment required (see Figure 2). Figure 2: Airport traffic will re-enter the WB DIAAH at mile marker 1.8. This work was originally scheduled for Friday, Dec. 8, but was postponed due to the possibility of a winter weather event. All work is weather dependent and subject to change.